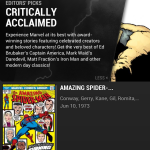 You are here: Home / Marvel Unlimited / Did I Single-Handedly Fix the Marvel Unlimited App? Did I Single-Handedly Fix the Marvel Unlimited App? Ok, fine, I might be overselling the impact of my – now legendary – Marvel Unlimited App review. App update version 1.1 became quietly available on Thursday, April 25. I don’t know about you, but I tend to let app updates sit for months at a time, largely assuming the changes won’t be all that significant. In this case, if you’ve had problems or issues with the Marvel Unlimited App (and I know a lot of us have), the update is legitimately useful. Ultimately, this might be the most important part to version 1.1. I can’t sit here and claim that every Marvel Unlimited problem or bug is gone, but so far I haven’t had the app crashing every time I tried to open it, and I haven’t had the weird search glitch where the keyboard took over the app like the Blob coming off a hunger strike. All things considered, this feels like great work by the Unlimited app team. I know the Marvel Unlimited app crashing was one of the single biggest turn-offs originally, and while you’d like to see that 100% taken care of out of the bag, the app update is a nice reminder that services like this are living materials. They change and improve while we do nothing but read Planet Hulk and work and read Planet Hulk at work (I’m not judging). That said, I can only speak from my own experience in terms of seeing these bug fixes. If you’re still plagued with them and want to throw your Marvel Unlimited subscription at the nearest Skrull, the comments offers some great group therapy. This is a nice one for iPad readers, although honestly I felt pretty alright about the single page view of the iPad reader on launch. So much empty space, now gone! While this one is nice, it kind of highlights a bigger issue. The smart-panel reading on the app can be a nightmare. Again, on the iPad this becomes way less relevant because you’re reading on a reasonably sized screen. But on an iPhone? Check out this attempt to read the penultimate issue of Iron Man’s Armor Wars (hey, I’m catching up before the movie, what can you expect). No really, I’ll take it from here, thanks Smart Panel! When you see fans complaining about ‘unreadable’ panels… well, look no further. So full-screen is a definite positive, but the smart panel mobile experience has room for improvement. Big time. 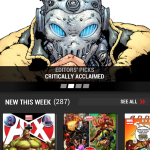 Those curated comic book suggestions from the desktop site have made it live to the app. Naturally, I’m a big fan of anything that helps readers find new material, so it’s cool to see the Marvel Unlimited app trending this direction. The recommended reading that’s actually supplied could use some improvements (the content mentions Mark Waid’s run on Fantastic Four but fails to actually include that material), but all in all I like the direction. 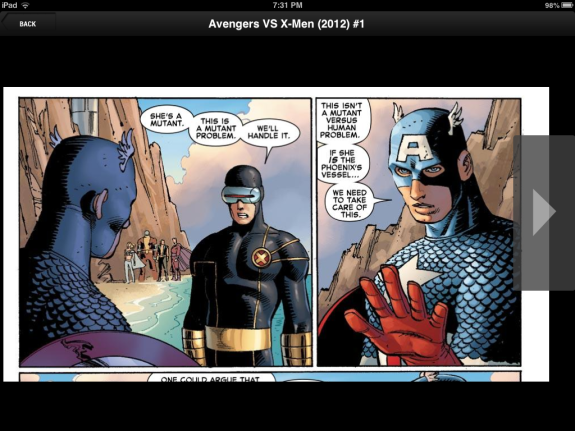 – Ability to purchase digital comics in the Marvel Comics app. 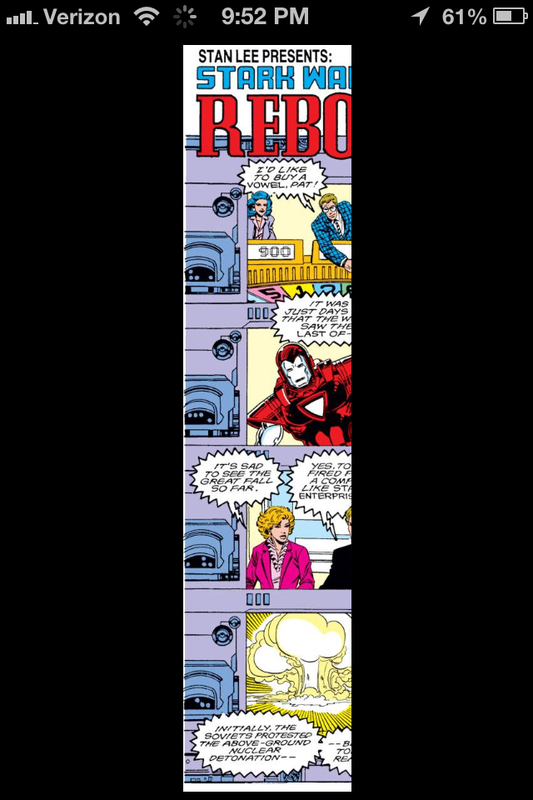 This one’s a move I advocated, although in some ways it calls into question the quality of the Marvel Unlimited app. If I could read this for free on the Unlimited app… why would I pay for a digital version to read using Comixology reader tech? Yes, you technically then ‘own’ a digital copy, but as we’ve seen this year, digital comic ownership isn’t all it’s cracked up to be. My original recommendation regarding digital purchases was in regards to ongoing series or new comics. One of the biggest issues fans seem to have with Marvel Unlimited is the fact that the reading selection is actually limited by publication date. I’m of the opinion that a digital library of this size is still one of my favorite things, but if you want the latest and greatest… Marvel Unlimited can’t quite give you what you crave. This becomes slightly less problematic if there’s at least a clear option to continue reading the newest comics for those who’d rather pay a few bucks then wait a few months for the next issue of a series. This isn’t quite what Marvel Unlimited is offering at the moment, but I can appreciate that they’re offering a clear move to purchase from their app. Dollars is dollars after all. So there you have it, that’s the Marvel Unlimited app update in a nutshell. The reviews of the app have improved significantly since the update. Personally, I like the general direction, I’m really happy to see a legitimately significant update, and I’m still a mostly happy Marvel Unlimited subscriber. Feel the same, or completely the opposite? Do what feels right to you in the comments. Up until about 3 days ago I would have agreed with you, the new updates are brilliant, much better reading experience…until my library stopped showing up on the app! It’s completely empty despite me having 20-odd comics in there when I check the web based version and using the refresh button makes no difference at all, it just continues to load until the screen of my Galaxy Tab 2 goes to sleep and then…no change when I unlock the screen again! Not a deal breaker as I can use the web browser version to record my library and still view my comics on the app but it’s frustrating having to keep switching between the two! I was so glad to see an update in the App Store, and it is much improved, but there are still some bugs. Some comics take forever to load, to the point that I have to quit the app, re-open and try again. •A ‘pull list’ that would populate based on what series you’re reading. That way if the next Hawkeye becomes available on MU, it’s automatically right there ready for you. Those are both awesome ideas. A quick “you should read this next” recommendation at the end of a comic would make this a much smoother experience (and would probably cut my time interacting with other humans by half). Pull list is a sweet option too. The old Unlimited service offered a “must-reads” selection, so you could at least keep tabs on the books you knew you wanted to read. But it never got to the point of alerting you when a new issue was released, which would be fantastic. I have a nexus 7 and mu is just broken. Does not fill the screen and panels are cut off completely in smart panel mode. Also moving to the next page is a nightmare. Smart panels can be a complete wreck. Fixing that would alleviate a ton of the reading problems. You may be doing this already, but make sure to swipe in the center of the screen to change the panel. Tapping or using the arrows will keep the menu items on screen. It is also worth mentioning that as they improved the app they also improved the underlying engine that drives the app which also drives the Beta Reader used when viewing via a web browser. My primary mode of using MU is a web browser on a Kindle Fire. And this update added some usability improvements to the Reader. Good work MU team. Keep it up. That’s a really great insight, Nic, thanks for pointing that out.